Social media is officially part of the business environment. Your customers expect you to be active online and available to answer any questions they have and your employees are already visiting social channels on a daily basis. 47% of employees now use social networks to connect with customers. This is a number that’s consistently growing thanks to trends like omnichannel customer service and employee advocacy. Giving your staff free reign over their social media presence puts your entire company at risk. Yet, while Pew Research Center suggests that 74% of adults are on social media, it also indicates that 73% of companies lack a social media policy. It’s time to fix the gap. What is a company social media policy? A social media policy is your business code of conduct, letting people in your organization know how to act on social media. Many organizations make the mistake of waiting until they’ve already faced a PR disaster to put a policy in place. However, setting a strategy up in advance protects you from dealing with those problems, to begin with. Defends against security risks and legal issues: Social media presents complicated considerations for things like privacy law. Fortunately, robust social media policies outline the dangers of sharing online and keep your employees out of trouble. Empowers your staff: Social media policies allow you to unlock all the benefits of employee advocacy, without putting your brand credibility at risk. A plan is a critical advocacy tool, giving your people the guidance they need to accurately represent your organization online. Protects your brand: Your social media policy ensures that whenever someone interacts with your company online, either through a brand channel or an employee, they get the same consistent experience. This develops a more reliable, trustworthy identity for your company, turning customers into loyal fans and ambassadors. Posting defamatory, derogatory, or inflammatory content. Posting information or pictures that imply illegal conduct. The first thing any policy should do is explain who can speak on behalf of your business online. 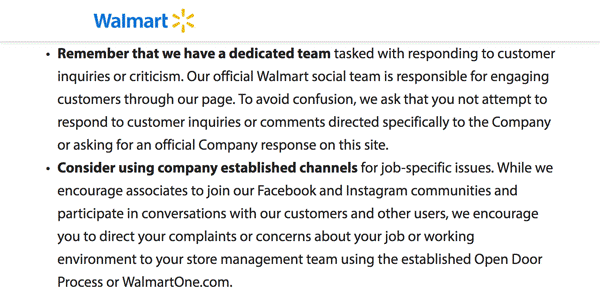 When it comes to social media policy examples, Walmart has a comprehensive set of guidelines. The retail company states that no regular employee should answer customer complains or questions directed towards the company. While these kinds of rules might seem restrictive, it’s often best for larger companies to err on the side of caution. Brand guidelines: How to talk about your products, services and company. Confidentiality: Which details should absolutely not be shared on social media. Consequences: What will happen if they fail to use social media correctly. It’s easy for conflict to escalate quickly on social media. The way that public sentiment on these channels rapidly changes means that small problems quickly snowball if not dealt with appropriately. If someone leaves a negative comment about your brand online, or you find yourself dealing with a disagreement, make sure your employees know how to respond. Alternatively, you may just have a list of rules to follow within your company social media policy. The most important thing to remind your employees is that whatever they say on social media, they’re representing the company – even when on their personal accounts. An excellent way to make sure that conflicts are always handled properly from the start is to set up pre-approved responses to common issues in a social media management platform like Sprout Social. These responses let your customers know that you’re aware of their concern and direct them towards the right person to resolve the problem. 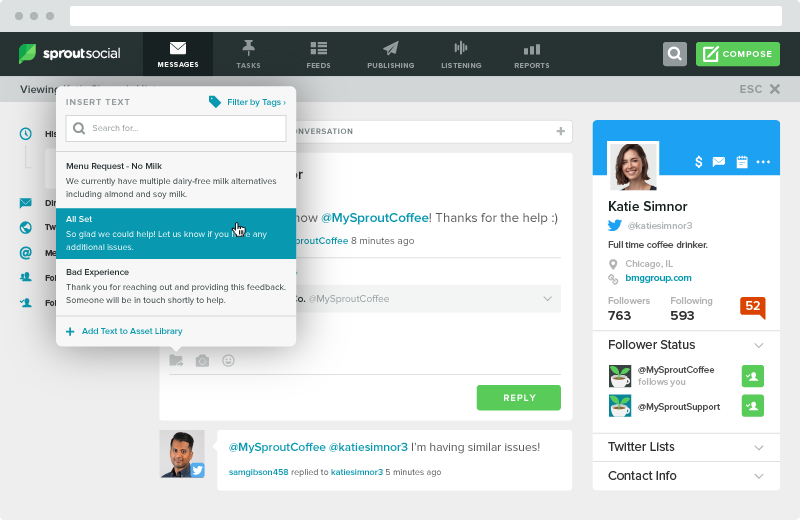 You can even use Sprout’s social listening to ensure you’re the first to know when someone says something negative about your brand. The faster you’re aware of a problem, the easier it is to fix it before the fire spreads. You may not be able to control everything your employees do and say on their personal social media accounts. However, it’s important to show them why their behavior on personal profiles affects your company and how they can avoid conflict. It’s also a good idea to include a disclaimer on personal accounts that reminds your customers that your employee is an individual and not a spokesperson for your organization. For instance, Best Buy’s social media policy reminds team members to state that all of their posts are their own. By separating themselves from their employees’ opinions, Best Buy reduces their risk of a PR nightmare. How to credit sources: Where did the information your employee is sharing come from? Crediting images and other information is crucial. Privacy and disclosure procedures: Let your employees know which information is considered confidential, such as customer information. Disclaimers: Let your staff know what a disclaimer means when they use it online. As the City of Edmonton outlines in their social media guidelines, even if someone states that their opinions are their own, they’ll still be seen as a representative of the city by the public. Regulatory challenges: Certain industries like finance, government, healthcare and so on have specific regulatory obstacles. Outline any rules that may be associated with your industry. 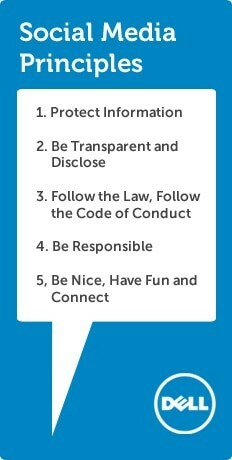 Dell’s social media policy includes a series of rules for employees, including 3: Follow the Law, Follow the Code of Conduct. Finally, social media is a common resource for criminals and scammers. It’s essential for your social media policy to include guidelines that protect your employees and your company. Whether it’s defending against phishing scams or ransomware attacks, make sure that everyone in your organization is vigilant about online protection. How to create secure passwords and set up two-factor authentication for brand and personal social media accounts. How to keep software updated and devices secure. How to respond if a security breach takes place. 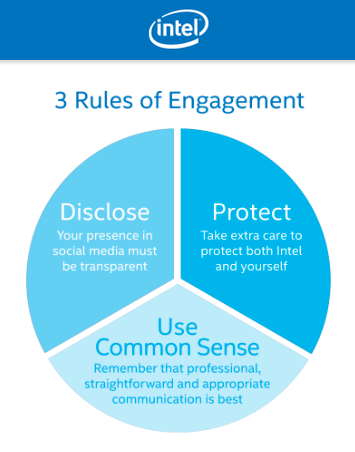 For social media policy examples that take security seriously, look at Intel. The computer company separates their policy into five separate parts, including sections for protecting trade secrets, disclosing information and using common sense for security. The safer your employees are with their social media actions, the more secure your business becomes. As powerful as social media is for your brand, it’s not always easy to use. For years, organizations avoided the complexity of things like compliance and security on social media, by encouraging their teams to stay away from social media entirely. Unfortunately, that’s no longer an option for most brands. Even if you could avoid social media, the chances are you won’t want to. After all, employee advocacy delivers up to 1,000 times more traffic for your business. Social media in the workplace doesn’t have to be a terrifying thing. All you need to do is put the right time and effort into developing a social media policy that works. Your employees are already active on social channels and they have the power to deliver incredible results for your company. Give them the freedom to support your business with the right set of guidelines.